The intent of the first sign is obvious. The second sign I assume is the result of Door County tourists coming and asking for cherry wine and walking out when informed that they do not have any (several wineries in Door County specialize in cherry wine). The sign hopefully clears up any confusion though I would wager they probably get 20 people a week who don’t read the sign and ask for cherry wine. I for one am not a huge fan of other fruit based wines. Maybe it comes from my early years in college when I would make apple and cherry wine from sugar, yeast, and juice from the UW-Milwaukee dorm cafeteria. A few glasses and you were drunk for about 6 hours, hangover for 24. Stone’s Throw offers a $3 tasting. 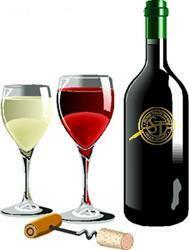 You get a great chardonnay-style wine glass with the Stone’s Throw Logo and the chance to sample 4 or 5 wines. They provide a sheet with a description of the wines and encourage (as any good winery should) you to go from light to dark. I tried the Chardonnay, Rose’, Big Mouth Red, Cabernet, and Port. The Chardonnay ($17) was really enjoyable. I love Chardonnay when you can taste a hint of Oak and I like it even more when there is a creamy finish (an affordable bottle of Yellow Tail is a perfect example of what I like in a Chardonnay), this hit the mark on both fronts. Moving on to the Reds, I tried the Big Mouth Red, which was a delicious, full bodied red. It had the peppery bite of a Zinfandel, which I loved. I almost used one of my allotted tasting samples for another glass, but decided to buy bottle instead ($18). The Cabernet ($20) was only average. It wasn’t bad it just didn’t do much to distinguish itself from other Cabs. Maybe the Big Mouth Red spoiled me. Finally the moment I had been waiting for arrived. The Port! I absolutely love Port and was excited to see how Stone’s Thow Port ($22) would stack up. I was even more excited because it was a Zinfandel (my favorite wine style) based Port. It was pretty good. It had a bit of a strong aftertaste and didn’t finish as smooth as some other similarly priced Ports but I really enjoyed it. It would make the perfect after dinner drink in the dead of winter. I didn’t have any here, but their Old Vines Zinfandel rivals any California Zin. The nearby Mission Grill (see review elsewhere on this site) offers this and several other Stone’s Throw Wines. My only complaint is that they don’t offer a cracker or pretzel or hunk of bread to help cleanse the palate between tastings. The first couple of sips of each wine were a bit off because I could still taste the previous sample. Oh, and it would have been nice if our tasting glasses were rinsed out before they wrapped them up for us. I was surprised to find a sticky red wine residue in my glass when I unwrapped it a week later. If you are stuck in Door County on a rainy afternoon I would highly recommend killing an hour at the Stone’s Throw Winery. They also have occasional concerts and other events, which I hope to be able to attend in the future. There is a small food section as well with many great wine-related food items. Try a bottle of Sarah's Dipping Sauce. Grilled salmon glazed with this stuff is incredible. Also try the Volpe’ mozzarella and prosciutto roll. Prosciutto and basil wrapped in a creamy mozzarella. Goes great with any of their white wines.